Set up camp on the icy tundra and live the life of an explorer studying the ways of the great Emperor Penguin. Click here to play! Living in the snowy terrain, you'll need to make note of the feeding and mating rituals of this flightless bird. The more you collect on this animal, the more money you'll receive once you've finished your mission. Prepare yourself for an arctic adventure! You'll get the most from the Baby Penguins, so be sure to watch out for them. They only appear on reels 2, 3, and 4, but they will substitute for all other symbols (excluding scatters) and double your prize when they appear in a winning combination. The male Emperors are also extremely valuable in your research. If you can manage to get five of these, you'll win 2500 times your original line bet. 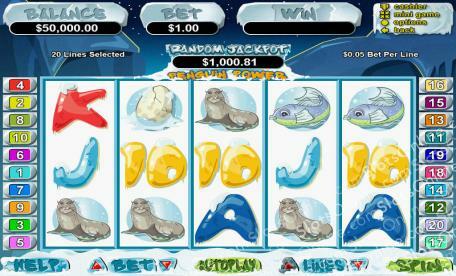 Two to five seals pays off 1000 times, and fish and penguin eggs are worth up to 500 times your bet. Besides being a resourceful form of shelter against the freezing temperatures, two or more igloos anywhere on the board will multiply your total bet. They will also access a bonus scatter in which you'll receive a number of free games. These little ice homes will prove to be invaluable out there! Grab your warmest coat and a wooly hat because you're going to need it while winning loads of prizes amongst the Penguins. The igloo acts as the scatter symbol. Two or more of these symbols anywhere on the board and your total bet will be multiplied respectively. Three of these will trigger the Penguin Slide feature in which you get the chance to win up to 25 free games. Extra igloos and baby penguins will be added to the reels. If, during the feature, you get a baby penguin on the same horizontal level as an igloo on reels 1 and/or 5, the penguin will slide to the igloo to reveal a prize. The playful Baby Penguin will replace all other symbols excluding the scatters. He only appears on reels 2, 3 and 4. Prizes are doubled when the Baby Penguin appears in a winning combination.